Saint Bathild was an Anglo-Saxon slave-girl who was sold by Danish raiders into the household of the chief officer of the Frankish imperial palace, Erchinoald, in the first half of the seventh century. Being physically beautiful and humble and obedient in soul, she quickly won the favor of the prince, and was nearly always in his presence, even bringing him drinks in his bedroom. She also served the older women in the household, washing their feet, dressing them and helping them in every way. When Erchinoald's wife died, he wanted to marry the beautiful English maiden. But Batilda, alarmed at the prospect, both by reason of her modesty and of her humble status, disguised herself in old and ragged clothes, and hid herself away among the lower servants of the palace; and he, not finding her in her usual place, and thinking she had fled, married another woman. Then Divine Providence, which raises the poor from the dung-hill, arranged that Bathild should attract the attention of the King of France, Clovis II, and in the year 649 they were married. From this marriage three sons were born: Clotaire III, Childeric II and Thierry III. Bathild proved to be an exemplary queen. Using her influence with the king her husband, and with the help of Abbot Genesius (later Bishop of Lyons), she gave great alms to the poor and to the churches of God. After the death of King Clovis in 657, she became regent of the kingdom in place of her son Clotaire, who was only five, and ruled capably for eight years with Saint Eligius (Dec. 1) as her advisor. 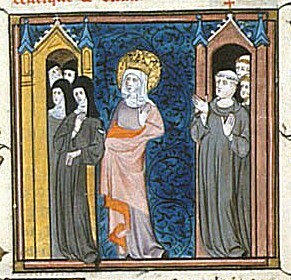 She founded the monasteries of Corbie and Chelles, gave generous alms to many others, and urged hierarchs and abbots to enforce the keeping of the monastic rules. 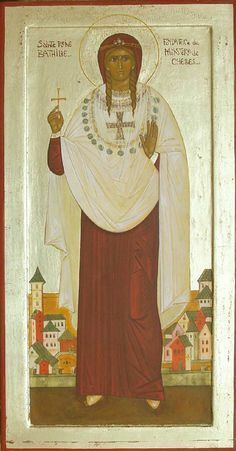 She supported the work of Saints Ouen and Leger, put an end to the simoniac buying of offices in the Church, suppressed the slave-trade of which she herself had been a victim, and redeemed many slaves. At that time the poorer inhabitants of France were often obliged to sell their children as slaves to meet the crushing taxes imposed upon them. Bathild reduced this taxation, forbade the purchase of Christian slaves and the sale of French subjects, and declared that any slave who set foot in France would from that moment be free. Indeed, through her work France may be considered the first nation to have eliminated the slave trade. In the political sphere, the Austrasians were persuaded to accept her son Childeric as their king, which led to the union of the Franks and the Burgundians. 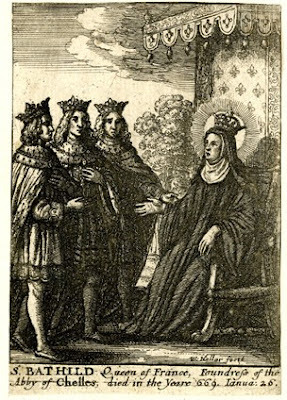 However, in 667 a plot hatched by Bishop Sigebrandus, which caused her sons to entertain unjust suspicions of her temporarily, led to her retirement to the Monastery of Chelles, near Paris. There she remained in obedience to Abbess Berthille until her death, performing all the humblest tasks and displaying all the virtues to perfection. Finally, when she had fallen ill with a very painful intestinal disease and was close to death, a beautiful vision was shown to her. She saw a ladder standing in front of the Church of the Mother of God, the summit of which touched the heavens; and it was as if Bathild herself was ascending the ladder in the company of the holy angels. The Saint now realized that her end was approaching, but she hid this from the abbess for fear that she would fall ill from sadness. And so, having raised her eyes and hands to heaven, her holy soul was released in peace, and a heavenly light covered her bed. This took place in the year 680, very shortly after the death of her goddaughter, a little girl whom she had wanted to accompany her into the next world. Many miracles were wrought through the intercession of the Saint after her death. Once a bishop came to the monastery and brought his child, who was demon-possessed and very violent, to the sepulchre of the Saint. The demon cast the child half-dead onto the pavement; but he stood up, crossed himself, thanked God and returned to his parents completely sane. According to William of Malmesbury, some of Saint Bathild’s relics were deposited at Glastonbury.